Do you find yourself going out for the same 2-4 mile run, at the same pace, but wish you could feel faster and go longer? Do you set the treadmill at one speed and then get bored before you accomplish your goal? 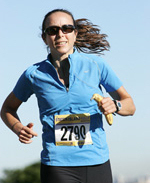 Please join our running classes and Jennifer will help you over those hurdles. You will love the camaraderie of a running group to reach your goals of running faster, stronger and longer. Jennifer will lead you through interval and speed workouts, hill repeats, tempo runs and long training runs for your specific goals. Fridays @ 9:00am: Running with total body conditioning workout. Push-ups, Pull-ups, Dips, Step-Ups, Lunges, TRX, jump rope. WHY: To get in better shape, lose weight or weight maintenance, receive support from a coach and other runners and/or train for a race. The class will be held rain/snow or shine. If it is thundering or lightning within 30 minutes of the scheduled class time, I will cancel the class. Otherwise, we will run in the rain. Any Questions? Feel free to contact Jennifer.